Pug mixer inner walls are constructed of SS or MS sheets. The mixer consists of a centre shaft of appropriate diameter and is either made of S.S or M.S material. The centre shaft is fitted with specially designed agitator blades in order to provide contraflow action. Contraflow ensures constant circulation of mix/blend ingredients from one end to another to homogenise the batch.Both the ends of the vessel are provided with stuffing boxes on the shaft. Blend ingredients are prevented from leaking and entering into bearings by the stuffing box. The shaft is supported by heavy duty pedestals. 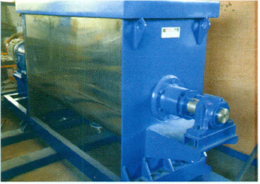 For models below 300 kgs the unit is provided with a pulley drive system along with tilting arrangement for discharge. For models above 300 kgs the unit is provided with a gearbox drive coupled to a motor and the discharge valve provided at the bottom.